Snow, Dean. "Abenaki". The Canadian Encyclopedia, 16 October 2018, Historica Canada. https://www.thecanadianencyclopedia.ca/en/article/abenaki. Accessed 25 April 2019. 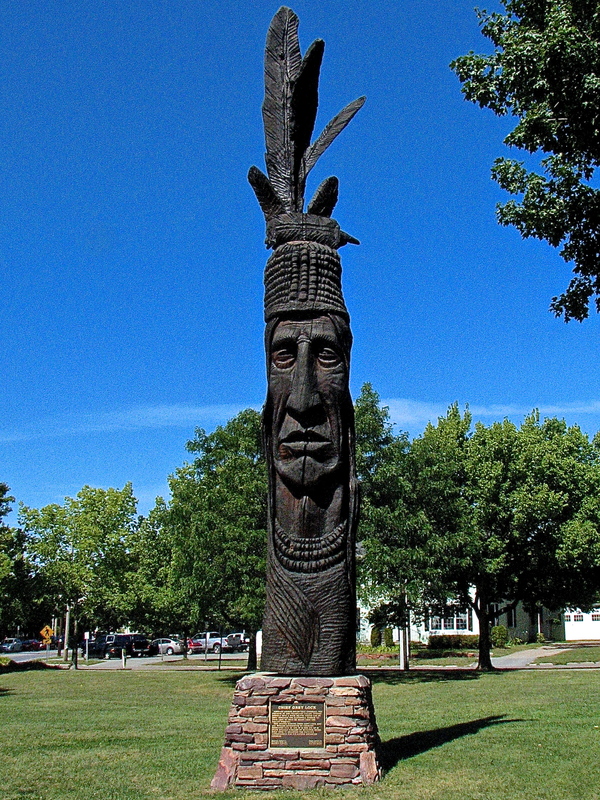 Dedicated in 1984, this statue (located in Battery Park, Burlington, Vermont, USA) honors Abenaki Chief Grey Lock and all Indigenous peoples in Vermont. The Abenaki Nation is generally divided into two groups: Eastern and Western Abenaki. Together, the two groups have historically covered areas from Lake Champlain in Quebec	to parts of Maine, New Hampshire and Vermont in the United States. Together with the Wolastoqiyik (Maliseet), Passamaquoddy, Mi’kmaq and Penobscot, the Abenaki formed the Wabanaki Confederacy in the 1680s. This was a political and cultural union that played a significant role in wars against the Haudenosaunee and in the American Revolution. (See also	American Revolution — Invasion of Canada.) In 1993, the confederacy was revived, and now includes the Métis Nation. Since then, the confederacy has asserted Indigenous rights in issues regarding ecology, health, and access to land and natural resources. There were also several Algonquian bands in New England who were culturally and/or politically associated with the Abenaki, including the Caniba (or Kennebec), Norridgewock, Androscoggin, Wawenock and Pequawket. In the 2016 census, 9,775 people identified as having Abenaki ancestry. According to the Government of Canada however, the total population of Abenaki people registered with the Wôlinak and Odanak First Nations in 2017 is 469 and 2,537, respectively. Abenaki people also reside in other parts of Canada as well as in the United States. During much of the 17th century, the Abenaki were hunters, fishers and gatherers. Favoured game was more often moose than deer. They travelled mainly by birchbark canoes on lakes and streams, and lived in villages near waterfalls on major rivers during the seasons when migratory fish could be harvested. During other seasons, they dispersed in family groups to the coast or to small camps on interior tributaries. These camps became the bases of trapping territories during the heyday of the fur trade. 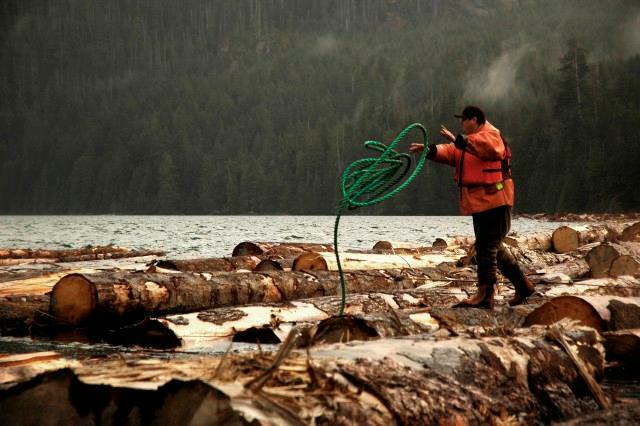 When the trade declined, many turned to the lumber industry and basketry. Attempts to adopt agriculture did not succeed until after the fur trade developed because farming alone was too risky as a full-time occupation. The Abenaki adapted quickly to the fur trade and a world economy. Abenaki culture is rich with oral histories, traditional teachings, art, drumming and dancing. 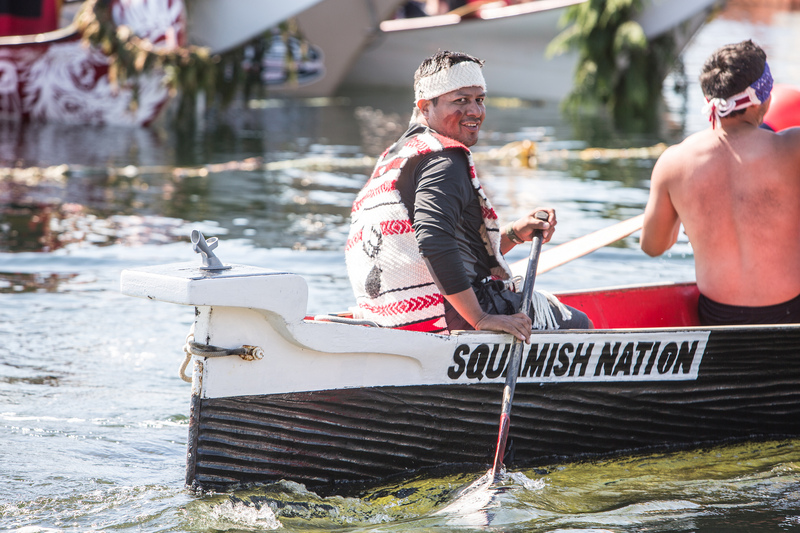 Although some traditional practices and ceremonies were suppressed by restrictive federal policies and legislation, such as residential schools	and the Indian Act, Abenaki culture has survived and continues to thrive. The Musée des Abénakis, a museum that focuses on Western Abenaki history and culture, is located in Odanak. Some well-known Abenaki people include filmmaker and singer Alanis Obomsawin, artist Joyce Panadis, chief and writer Joseph Laurent and artist Christine Sioui-Wawanoloath. Gici Niwaskw is the “Great Spirit” or Creator in Abenaki and southern Wabanaki tribal lore and spirituality. Sometimes referred to as Tabaldak/Dabaldak (“Lord”) or Niwaskowôgan (“Great Spirit”) in Abenaki, the Creator is a benevolent and abstract being, who does not directly interact with humans. As in other Algonquian communities, the Great Spirit in Abenaki tales is rarely personified, and oral legends did not assign the Creator a gender. Gici Niwaskw is said to have created the entire world. In some Abenaki tales, there was no sound or colour until the Creator filled the empty earth with life and light. He commanded Tolba, the Great Turtle, to emerge from the water and form the land. Gici Niswaskw created mountains and valleys on Tolba’s back and clouds above his head. While he slept, Gici Niswaskw envisioned humans and different types of animals. When he awoke, he saw that his dream had become a reality. Different Abenaki people have variations of this and other creation stories, but all generally feature a Creator figure. While the Creator made the world and the creatures upon it, the details of maintaining and transforming or taming the landscape was given to the cultural hero Gluskabe (Glooscap or Klusklap), who figures importantly in many Wabanaki tales. There are various versions of the story, depending on the nation. According to most tales, Gluskabe is not a god, but a cultural hero, a trickster	who had supernatural powers and used them to manipulate the world around it, making it more habitable for the humans. For example, he tempered the winds, tamed wild animals and managed the waters. In many tales, he leaves the Abenaki, but promises to return if they ever need him. The Abenaki are prominent in the journals of explorer Samuel de Champlain, and those of other explorers and missionaries. Between 1600 and 1650, there were approximately 13,800 Eastern Abenaki and 12,000 Western Abenaki. Within a few decades of contact with Europeans, Old World diseases, particularly measles and smallpox, reduced the populations in many communities by up to 98 per cent. 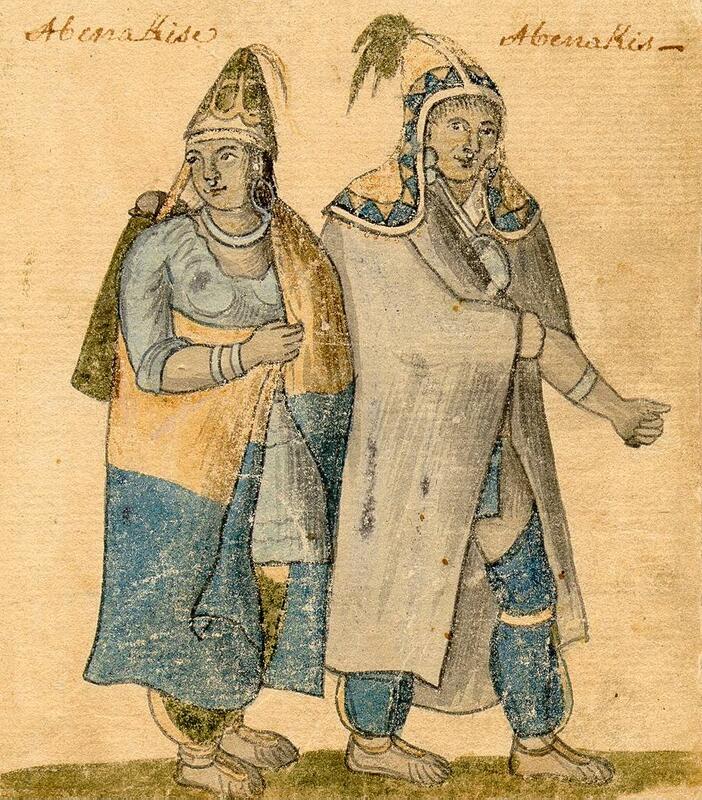 Surviving Western Abenaki withdrew into refugee communities in northern New England and Quebec. (See also Abenaki of the St. Lawrence Valley.) The Eastern Abenaki were not as devastated by warfare and disease, and their principal community at Old Town, Maine, has survived to the present. Traditional allies of the French, the fall of New France left the Abenaki with little defence against English expansion after 1760, forcing them into weak alliances with other Indigenous nations formerly allied with the French. The Abenaki (and other Eastern Indigenous nations) signed treaties with the British during the 1700s commonly known as the Peace and Friendship Treaties. These agreements were chiefly designed to prevent war between enemies and to facilitate trade. The American Revolution split the Eastern Abenaki from the Western Abenaki, most of whom were living in Quebec. The Abenaki remained divided in their loyalties through the War of 1812. A land claim settlement in February 1995 between the Eastern Abenaki Penobscot Nation and the State of Maine was broadened to include allied Maliseet	and Passamaquoddy residing there. In 1996, the Odanak and Wôlinak First Nations filed a land claim for a former reserve located northwest of La Tuque, known as Crespieul. Created in 1894, the Abenaki alleged that the 33.8 km² reserve was ceded (surrendered) to the federal government in 1910 without their proper consent. The claim was accepted for negotiation in 2001; in 2003, the parties began the negotiation process. The claim was settled in 2007. For the loss of their lands, the Odanak and Wôlinak First Nations were awarded about $4.8 million. Today, most Abenaki are engaged in mainstream occupations of Quebec and New England. They continue to be known for the quality of their split basketry and their lively folklore. There are several organizations that exist to foster various aspects of traditional Abenaki culture and to promote broader understanding of their history and arts. D.R. Snow, The Archaeology of New England (1980). Colin Gordon Calloway and ‎Frank W. Porter, The Abenaki (1989). F. Speck, Penobscot Man (1970). Colin G. Calloway, The Western Abenakis of Vermont, 1600–1800: War, Migration and the Survival of an Indian People (1994). Henry Lorne Masta, Abenaki Indian Legends, Grammar and Place Names (2008). Gerard Rancourt Tsonakwa and ‎Yolaiʼkia Wapitaʼska, Seven Eyes, Seven Legs: Supernatural Stories of the Abenaki (2001). Frederick Matthew Wiseman, The Voice of the Dawn: An Autohistory of the Abenaki Nation (2001). MUSÉE DES ABÉNAKISApprenez-en davantage sur le peuple abénaki en explorant le site du musée. CONSEIL DES ABÉNAKIS D’ODANAK Explore the website of the Abenaki Nation of Odanak. GRAND CONSEIL DE LA NATION WABAN-AKI INC.Learn more about Le Grand Conseil de la Nation Waban-Aki Inc., a Tribal Council grouping the Abenaki bands Odanak and Wôlinak. CONSEIL DES ABÉNAKIS DE WÔLINAK Learn more about the Abenaki Nation of Wôlinak. APTN Read the article by Trina Roache, Wabanaki Confederacy: ‘We’re not dead, our fires are still burning strong’. MUSÉE DES ABÉNAKIS Learn more about the Abenaki people as you explore the museum's site. NEW FAMILIAR ABENAKIS AND ENGLISH DIALOGUESRead the first vocabulary ever published in the Abenaki language, written by Chief Jos. Laurent and published in 1884. GRAND CONSEIL DE LA NATION WABAN-AKI INC.Apprenez-en davantage sur Le Grand Conseil de la Nation Waban-Aki Inc., un conseil tribal qui regroupe les bandes abénakises d’Odanak et de Wôlinak. CONSEIL DES ABÉNAKIS D’ODANAKExplorez le site Web de la Nation abénakise d’Odanak. CONSEIL DES ABÉNAKIS DE WÔLINAKDécouvrez la Nation abénakise de Wôlinak.